Menjadi salah satu Raksasa Metal terbesar sepanjang sejarah baru setelah Metallica, tentunya nama Megadeth masih menjadi sosok Band pengusung Speed/Thrash Metal kemudian lebih berevolusi dengan gaya Heavy Metal/Rock kental memasuki Dekade 90-an. terbentuk sejak tahun 1983 di San Francisco/Los Angeles, California oleh Frontman Dave Mustaine pasca dirinya didepak dari tubuh Metallica dan menjadi kontroversi berakhir dengan perseteruan panjang untuk Dave Mustaine membuat " Rival " untuk nama Metallica. First of all, it isn't thrash, having more in common with hard rock than heavy metal: it is mid tempo, simple and radio-ready. There isn't a riff to speak off, just some easy-going three or four chord patterns. The solos are disappointing and simply exist out of necessity, barely a showcase of either Broderick or Mustaine's talent, talent which feels like it is being wasted with releases like this. The next issue is that, of course, Mustaine's old and worn voice isn't particularly appropriate but not worth complaining about at this point, even if it sounds like the words are being squished out of him against his will. Tetap masih mengusung Karakter Bernyanyi Khasnya, Dave Mustaine seperti sedang terus melakukan pertarungan dengan Industri musik pasca Album " The World Needs a Hero " tahun 2001 berujung sempat keluarnya Frontman Dave Mustaine dan kembali lagi Tahun 2004 untuk merilis EP dan CD " The System Has Failed ", Megadeth bagi Gw seperti sedang terasa mengalami Dekadensi Musikalitas perlahan lahan sejak mundurnya 2 drummer penting Band, Nick Menza dan Jimmy DeGrasso, meskipun Megadeth menemukan Shawn Drover dengan skill serta style yang berbeda, Nafas Megadeth memang sedang mulai mengendur. sehingga gw salah satu pengagum dasyatnya era " Rust in Peace (1990) " dan " So Far, so Good... so What! (1988) " jadi kurang respect dengan karakteristik bermusik Megadeth saat ini. walau " Youthanasia (1994) " juga memiliki sentuhan yang Sophisticated dengan gaya Melodius-nya, materi Terakhir " Th1rt3en " tahun 2011 semakin bikin gw harus sedikit meninggalkan Karisma Mereka. April 2013 menjadi beberapa pemberitaan hangat untuk materi baru Dave Mustaine Cs ini akan menjadi pack album gress-nya nanti setelah sudah tidak Bersama Roadrunner Records, Dave pun memulai sebuah Label sendiri bernama Tradecraft ini. Anyone familiar with this band's less than stellar 90s output will note that these guys were at their absolute worst when they were straying outside of the heavy metal realm, largely because Dave's riffs and guitar distortion sound really mechanical when played at slower tempos, and because his gruff-laden mutterings are not fit for the AC/DC scene. membawa tradisi yang lebih Back Root of Rockin-nya, nuansa kental ala Thin Lizzy, AC/DC, Gun N Roses dan beberapa Gaya Glam Rock 90-an, Megadeth lebih banyak melepas kegarangannya di album ini. mendengar track " Kingmaker " meski masih menyimpan kekuatan Era " Risk " serta " Cryptic Writings ", Megadeth Masih garang menggebrak pertemuan awal ini. To be fair, this song is not bereft of any aggression, but its punchy distorted character definitely clashes with the inherent 70s rock character of the principle riffs. Occasionally Dave will find himself reverting to old tricks with a quick 4 second pick up in motion, but largely this thing just dithers along at mid-tempo and refuses to really go anywhere. The vocal work struggles to be tuneful, and finds itself somewhere between Lemmy Kilmeister with a soar throat and a sickly frog trying to stay on pitch. tapi begitu mengejutkan memang bagi gw mendengar Track Ke-2 " Super Collider " yang dirilis sebelumnya sebagai Single malah menjauh dari konsep sebelumnya. More Rockin Attitude ! I expect something that is at least as frenetic and glorious as the quicker works as opposed to something that could almost pass for a Poison song with garbled vocals (didn't Mustaine mock Brett Michaels and company a few years back for their shallow music?). agak sedikit terobati dengan " Burn! " suasana sentuhan era " Peace Sells " mulai begitu menyentuh pada sentuhan Rythym beat-nya. The only real bright spot is the technical lead guitar work, which has a very similar flavor to the bluesy yet flashy work heard on "Peace Sells", but all the sweet frosting in the world won't save a cake that's been sitting stale for weeks. " Built for War " lumayan menampar dengan Straight Forward Thrash Riffing yang Intense. Complete with the rather uninteresting, simple yet memorable riffs (that I would rather be forgettable) especially in the chorus, the solo is nothing impressive, half of it being E-string tapping, and the bland, typical song structure with some 'Youthanasia' type drum beats, as heard plainly in the verses. Keep Rockin Again on " Off the Edge ", meski memiliki Speed Riffing " Dance in the Rain " yang menghidupkan Ilusi kita tentang kekecewaan yang mendalam, Track ini akan membenturkan kesebuah Dimensi yang berbeda. dengan Additional Vokal dari David Draiman-nya hard rock/alternative metal Band Disturbed, Kekuatan Athemic lagu ini kian Hidup. " The Beginning of Sorrow " sejenak sedikit mengajak kita ke era " Youthanasia " sekali. days the most with a slower feel and a much more formulaic structure that borderlines on radio rock. The most intense moments of these songs are generally found during the lead breaks, as catchiness is the implicit goal of these songs, and in this respect they are a success. Karakteristik track " Forget to Remember " semakin mengecewakan mungkin bagi Gw Seorang Fans Speed/Thrash Metal Megadeth jika mendengar Mereka harus mendayu dayu gaya Rockin-nya. You might think that this is a good thing, but let me tell you: it isn't. This is not a good record, and in my humble opinion it's a step down from their previous effort. dan Track Terakhirnya, Megadeth Mengcover ulang " Cold Sweat " Thin Lizzy menjadi sebuah bentuk warna Musik Megadeth saat ini. Menjadi Produser sejak Single " Sudden Death " tahun 2010, John Karkazis masih memegang kendali Produktifitas Megadeth bersama dengan Enjiner Cameron Webb yang sejak Tahun 2004 menggarap album2nya Motörhead. meski belum bisa memuaskan Dahaga gw, Rilisan yang lebih menjaring fans baru yang openminded dengan EasyCatchyStuff, Megadeth siap menjadi Band yang sellout dengan Pasaran. hmmm ... So what do I have to say for this in conclusion? There's nothing to really love or loathe about this besides the overly-climactic chorus, but even that's forgivable, as they've done worse before. Unlike most who absolutely despised this, I'm still looking forward to this album, and this might have been a weak track on a potentially good album, so don't let this fool you, and keep your eyes (and ears) open. I Still Missing " Killing Is My Business...and Business Is Good!, Peace Sells... but Who's Buying?, So Far, so Good... so What!, Rust in Peace and Maybe Countdown to Extinction " for Reproduce again. One thing is for certain, anyone who was not impressed with the complete genre-shift that occurred on "Risk" should steer clear of this song. Being one of the largest in the history of Metal Giants new after Metallica, Megadeth is still the name of course figure bearers Band Speed ? ?/ Thrash Metal then further evolved the style of Heavy Metal / Rock condensed into the decade of the 90s. formed since 1983 in the San Francisco / Los Angeles, California by frontman Dave Mustaine after he was kicked out of Metallica body and into controversy ended with Dave Mustaine's long battle to make "Rival" for the name Metallica. First of all, it is not thrash, having more in common with hard rock than heavy metal: it is mid-tempo, simple and radio-ready. There is not a riff to speak off, just some easy-going three or four chord patterns. The solos are disappointing and simply exist out of necessity, barely a showcase of either Broderick or Mustaine's talent, talent roomates feels like it is being wasted with releases like this. The next issue is that, of course, old and worn Mustaine's voice is not particularly NAMAs but not worth complaining about at this point, even if it sounds like the words are being squished out of him against his will. Remain still carrying Character Singing Typically, Dave Mustaine as being constantly doing battle with the music industry after the album "The World Needs a Hero" in 2001 had led to the release of frontman Dave Mustaine and back again in 2004 to release EP and CD "The System Has Failed" , Megadeth for Gw feels like I'm having decadence Musicality slowly since the resignation of two important band drummer, Nick Menza and Jimmy DeGrasso, although Megadeth's Shawn Drover find with skill and style are different, Breath Megadeth is being wound down. so i one admirers dasyatnya era "Rust in Peace (1990)" and "So Far, so Good ... so What! (1988)" so lacking respect to the characteristics of the current Megadeth music. although "Youthanasia (1994)" also has a Sophisticated touch with his melodic style, material Last "TH1RT3EN" in 2011 i had a little more and make Karisma They leave. April 2013 a few headlines for the new material Cs Dave Mustaine will be pack-gress of his album later after no longer Together Roadrunner Records, Dave also started his own label called tradecraft this. Anyone familiar with this band's less than stellar 90s output will note that these guys were at their absolute worst when they were straying outside of the heavy metal realm, largely Because Dave's riffs and guitar distortion sound really mechanical when played at slower tempos, and Because his Gruff-laden mutterings are not fit for the AC / DC scene. bring a more tradition Rockin Back Root of it, the feel of thick ala Thin Lizzy, AC / DC, Gun N Roses and some Style 90's Glam Rock, Megadeth release more ferocity in this album. heard the track "Kingmaker" though still keeping forces Era "Risk" and "Cryptic Writings", Megadeth is still fiercely kicked off this initial meeting. To be fair, this song is not bereft of any aggression, but its definitely punchy distorted character clashes with the inherent character of the 70s rock riffs principle. Dave will occasionally find himself reverting to old tricks with a quick 4 second pick up in motion, but largely this thing just dithers along at mid-tempo and refuses to really go anywhere. The vocal work struggles to be tuneful, and finds itself somewhere between Lemmy Kilmeister with a soar throat and a sickly frog trying to stay on pitch. 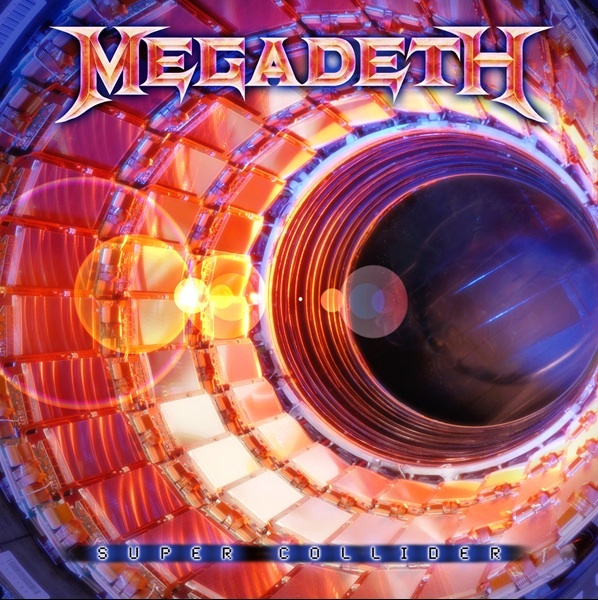 but as soon as i heard the shocking indeed for 2nd Track "Super Collider" previously released as singles instead move away from the previous concept. More Rockin Attitude! I expect something that is at least as frenetic and glorious as the Quicker works as opposed to something that could almost pass for a Poison song with garbled vocals (mock Mustaine did Brett Michaels and company a few years back for their shallow music?) . a little bit relieved by the "Burn!" atmosphere touches the era of "Peace Sells" began as touching on the beat Rythym touch. The only real bright spot is the technical lead guitar work, roomates has a very Similar flavor to the bluesy yet flashy work heard on "Peace Sells", but all the sweet frosting in the world will not save a cake that's been sitting stale for weeks. "Built for War" Straight Forward hefty slap with the Intense thrash riffing. Complete with the rather uninteresting, simple yet memorable riffs (that I would rather be forgettable) especially in the chorus, the solo is nothing impressive, half of it being E-string tapping, and the bland, typical song structure with some 'Youthanasia' type drum beats, as heard plainly in the verses. Keep on Rockin Again "Off the Edge", despite having Speed ? ?riffing "Dance in the Rain" that animate our illusion of deep disappointment, this Track will be banging kesebuah different dimensions. Additional Vocals by David Draiman of the hard rock / alternative metal band Disturbed, power is increasingly Life Athemic song. "The Beginning of Sorrow" little moment invites us into an era of "Youthanasia" once. the most days with a slower feel and a much more formulaic structure that borderlines on rock radio. The most intense moments of these songs are generally found during the lead breaks, as catchiness is the implicit goal of these songs, and in this respect they are a success. Characteristics of the track "Forget to Remember" probably more disappointing for Gw A Fan Speed ? ?/ Thrash Metal Megadeth when they hear they have to mendayu dayu his rockin style. You might think that this is a good thing, but let me tell you: it is not. This is not a good record, and in my humble opinion it's a step down from their previous effort. Track and last, birthday Megadeth cover "Cold Sweat" Thin Lizzy become a form of color Megadeth music today. Being Single Producer since "Sudden Death" in 2010, John Karkazis still in control Productivity Engineer Megadeth along with Cameron Webb who since 2004 worked album2nya Motorhead. although i have not been able to satisfy thirst, release more openminded to capture new fans with EasyCatchyStuff, Megadeth ready to be a sellout band with the Market. hmmm ... So what do I have to say for this in conclusion? There's nothing to really love or loathe about this besides the overly-climactic chorus, but even that's forgivable, as they've done worse before. Unlike most who absolutely Despised this, I'm still looking forward to this album, and this might have been a weak track on a Potentially good album, so do not let this fool you, and keep your eyes (and ears) open. I Still Missing "Killing Is My Business ... and Business Is Good!, Peace Sells ... but Who's Buying?, So Far, so Good ... so What!, Maybe Rust in Peace and Countdown to Extinction" for reproduce again. One thing is for certain, anyone who was not impressed with the complete genre-shift that Occurred on "Risk" should steer clear of this song.